Welcome to the OXOPS Box Office and Shop. Here you can purchase tickets for our shows and concerts. 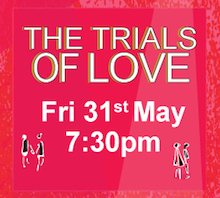 Tickets will shortly be available for "Trials of Love" which the society is performing on May 31st and June 1st. Meet Angela & Nick, two angels embroiled in an exciting board game. As the two play, the game comes to life and reveals the story of four couples. 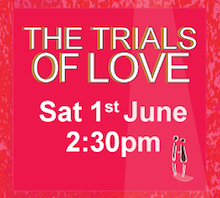 Including musical numbers from The Phantom of the Opera, La Traviata, West Side Story and The Merry Widow, The Trials of Love will take audiences on a turbulent journey featuring wonderful company numbers along the way! 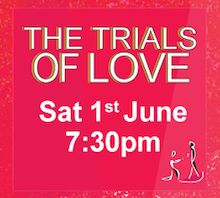 Tickets for The Trials of Love are now available. 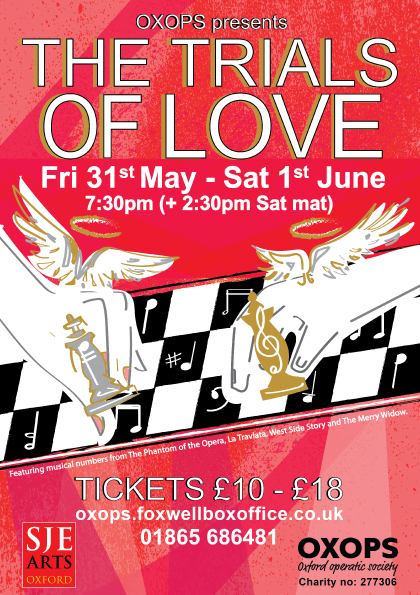 Performances are at 7.30pm on Friday, 31st May, and Saturday, 1st June. There is also a matinee at 2.30pm on the Saturday. Please click on the day required and you will be redirected to an appropriate seating plan for you to choose your seats. OXOPS Box Office and Shop is brought to you by Foxwell Box Office Services. © 2018 Foxwell Computing. All Rights Reserved.